The famous scene which Bluma’s fans love is printed on a T-shirt. The famous select shop in Harajuku, “offshore” collaborated with Dragon Ball in commemoration of the half-birthday.The products have been designed by a new brand, “ZATUON” which plans to carry out activities from 2017 to 2020. This T-shirt has an illustration of Bulma on the front and an illustrations of Kame Senin watching Bulma on both sleeves. It is definitely a cool item. A special T-shirt designed from the image of offshore’s AD poster with an illustration of Bulma’s bikini inspired by Lowbrow art. 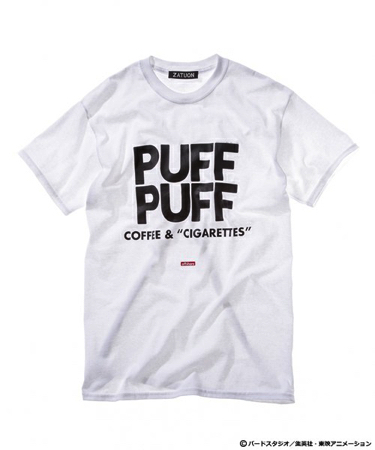 The word “PUFF PUFF” is printed on the front of the T-shirt. All men would love this item. This T-shirt born from the official collaboration. Let’s check these gorgeous collaborative items.